The Viannos massacres (Greek: Σφαγές της Βιάννου ή Ολοκαύτωμα της Βιάννου) were a mass extermination campaign launched by Nazi forces against the civilian residents of around 20 villages located in the areas of east Viannos and west Ierapetra provinces on the Greek island of Crete during World War II. The killings, with a death toll in excess of 500, were carried out on 14–16 September 1943 by Wehrmacht units. They were accompanied by the burning of most villages, looting, and the destruction of harvests. The loss of life amounted to one of the deadliest massacres during the Axis occupation of Greece, second only to the massacre of Kalavryta. It was ordered by Generalleutnant Friedrich-Wilhelm Müller, in retaliation for the support and involvement of the local population in the Cretan resistance. Müller, who earned the nickname "the Butcher of Crete", was executed after the war for his part in this and other massacres. Viannos is a mountainous area in the southeastern part of Heraklion regional unit, stretching between the feet of Mount Dikti in the north and the Libyan Sea in the south coast of Crete. Following the Battle of Crete in 1941 during which the island fell to the Axis, Viannos and the nearby Lasithi were part of the Italian occupation zone. Until the end of 1942, the Italians had hardly any presence in the area, hence facilitating the set up and activation of several resistance groups. Among them was one of the largest guerrilla bands in Crete, led by Manolis Bandouvas. In early 1943, the increasing activity of guerrillas combined with the rumors that the Allies had plans to invade Crete, led the Italians to start the construction of coastal fortifications and install garrisons in the region. On the other hand, the Germans had started since 1942 to station forces of their own in the coastal villages of Tsoutsouros and Arvi. In May 1943, they also established an outpost with three men in Kato Simi that were in charge of collecting potatoes for the provision of occupation troops and keeping the surroundings under surveillance. The Allied invasion of Sicily in July 1943 followed by the Italian armistice announced on September 8 and the smuggling of the Italian commander of eastern Crete Angelico Carta to Egypt, reinforced the rumors that an Allied operation against Crete was imminent. Prompted by this misapprehension, Bandouvas ordered an attack against the German outpost in Kato Simi. According to British sources, he acted without consulting the British; he anticipated that the Allies would soon land, and hoped that he would emerge as a national hero when they did so. Bandouvas later claimed he had instructed his men to capture the Germans alive, conforming to orders from Cairo. Nevertheless, his claims were denied by SOE agents Patrick Leigh Fermor and Thomas James Dunbabin. Another theory for Bandouvas’ motives suggests that he naively fell into a provocative trap treacherously set by the British who, preparing for the post-war era, aimed to wipe out the increasingly popular local units of pro-communist EAM/ELAS. In any case, on September 10 Bandouvas' partisans killed the two soldiers present at the German outpost at the time of the attack and threw their bodies in a crevice. The bodies of the two German soldiers stationed in Kato Simi were discovered and news of the incident reached their superiors, who ordered an infantry company to move to the village and investigate their fate. In the meantime, Bandouvas had realized that the village was in danger and he was left with no other option but to defend it. Thus, he set an ambush with 40 of his men in a valley near the entrance of Kato Simi and waited for the Germans. They appeared on the morning of September 12 and were assaulted with running fire. Despite their initial surprise, the Germans managed to retreat and a fierce battle began that lasted until the late afternoon. The Germans were finally defeated, suffering heavy losses (estimates on the number of German soldiers killed vary widely: more than 400 are estimated in, two companies are mentioned in ). 12 Germans were captured alive. Bandouvas' partisans lost only one man and withdrew to the mountains. On the day following the elimination of the German company in Kato Simi, a large force numbering more than 2000 men started to gather in Viannos. Exasperated by the loss of his men and wanting to set an example for fleeing Italians who were considering joining with the partisans, the commander of Heraklion Friedrich-Wilhelm Müller ordered troops of the 65th regiment of the 22. Luftlande Infanterie-Division garrison unit to destroy Viannos and promptly execute all males over the age of sixteen as well as everyone who was arrested in the countryside, irrespective of gender or age. Hence, a plan for the systematic destruction of Viannos was put into place starting on September 13. Separated into smaller groups, forces from the Grenadier-Regiment 65 surrounded the region, invading it simultaneously from various directions. At the beginning, they reassured the locals that their intentions were peaceful, persuading many of the men who had fled to the mountains to return to their homes. On the following day (14 September), indiscriminate mass executions, impromptu shootings and arrests, as well as looting, arsons, vandalism, demolition and destruction of harvests, took place. Survivors were forbidden to return to their ruined homes and bury their dead. Present-day view of Ano Viannos. Amiras memorial designed by sculptor Yiannis Parmakelis. The exact number of Greek victims remains unknown but most sources agree that the number exceeds 500, consisting of inhabitants of the villages of Kefalovryssi, Kato Simi, Amiras, Pefkos, Vachos, Agios Vassilios, Ano Viannos, Sykologos, Krevatas, Kalami and Loutraki (in Greek: Κεφαλοβρύσι, Κάτω Σύμη, Αμιράς, Πεύκος, Βαχός, Άγιος Βασίλειος, Άνω Βιάννος, Συκολόγος, Κρεβατάς, Καλάμι, και Λουτράκι) in east Viannos as well as those of Myrtos, Gdochia, Riza, Mournies, Mythoi, Malles, Christos and Parsas (present day Metaxochori) (Μύρτος, Γδόχια, Ρίζα, Μουρνιές, Μύθοι, Μάλλες, Χριστός and Παρσάς - Μεταξοχώρι) in east Ierapetra. About 200 more civilians were held hostages. Around 1000 buildings, mostly houses, were destroyed. The surviving villagers were forbidden to bury their dead or return to their homes, most of which had been burned to the ground. No reparations were ever paid to those who survived. It took the villages many years to recover, although some never managed to achieve that completely. Most of Bandouvas' guerrillas dispersed in the nearby mountains whilst he and a few men fled westwards, being chased by the Germans. They were joined by resistance groups of the White mountains range, and during October 1943, clashed with German detachments on several occasions. In reprisal, the Germans executed several civilians in the villages of Kali Sykia and Kallikratis. In November 1943, Bandouvas was eventually evacuated to Egypt. General Müller was captured by the Red Army in East Prussia and later extradited to Greece. Along with Bruno Bräuer, commander of the ‘’Festung Kreta’’ between 1942–44, he was charged with war crimes by a Greek military court. Both were convicted, sentenced to death on 9 December 1946 and executed by firing squad on 20 May 1947. No one else was ever brought to justice, nor any reparations paid to the families of the victims. Today, each village has a war memorial dedicated to their dead whereas a large memorial commemorating those who lost their lives during the September 1943 has been erected in the village of Amiras, located at 35°02′20″N 25°26′36″E﻿ / ﻿35.038816°N 25.443397°E﻿ / 35.038816; 25.443397. ^ Fermor, Patrick Leigh; Cooper, Artemis. Words of Mercury, John Murray, London, 2004, ISBN 071956106X. ^ Lewis, Damien. Churchill's Secret Warriors: The Explosive True Story of the Special Forces Desperadoes of WWII, Quercus Editions Ltd, 2014; ISBN 1848669178. ^ Schwarz, Peter. Die Plünderung Griechenlands und die Rückkehr der "deutschen Frage", gleichheit 4/2015, 2015. ^ a b c d e f Beevor, Antony. Crete: The Battle and the Resistance, John Murray Ltd, 1991. Penguin Books, 1992. ^ Moss, Stanley W. Ill Met By Moonlight, Orion, 2014, ISBN 9781780228808. ^ a b c Davis, Wes. The Ariadne Objective: The Underground War to Rescue Crete from the Nazis, Crown, 2013. ^ a b c Kokonas, Nikos A. The Cretan Resistance, 1941-1945, Zeno, London, 1993. ^ a b c d Stroud, Rick. Kidnap in Crete: The True Story of the Abduction of a Nazi General, Bloomsbury, 2015, p. 92. ^ Leong Kok Wey, Adam. Killing the Enemy: Assassination Operations in World War II, I.B. Tauris, 2015. ^ Muñoz, Antonio (2018). The German Secret Field Police in Greece, 1941-1944. McFarland. p. 84. ISBN 1476667845. ^ a b Στέφανος Α. Γεροντής. Τα καημένα χωριά. Μνήμες της καταστροφής των δυτικών χωριών της Ιεράπετρας το 1943. Έκδοση Νομαρχιακής Αυτοδιοίκησης Λασιθίου, 2008. ^ Καζαντζάκης, Ν., Καλιτσουνάκης, Ι. και Κακριδής, Ι.Θ. Έκθεσις της Κεντρικής Επιτροπής Διαπιστώσεως Ωμοτήτων εν Κρήτη. 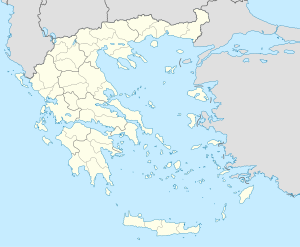 Σύνταξις 29/6 - 6/8/1945. Έκδοση Δήμου Ηρακλείου, 1983. ^ "History of the United Nations War Crimes Commission and the Development of the Laws of War. United Nations War Crimes Commission. London: HMSO, 1948". Archived from the original on 2012-04-01. Retrieved 2010-12-22. Wikimedia Commons has media related to 1943 in Viannos. This page was last edited on 24 February 2019, at 13:21 (UTC).